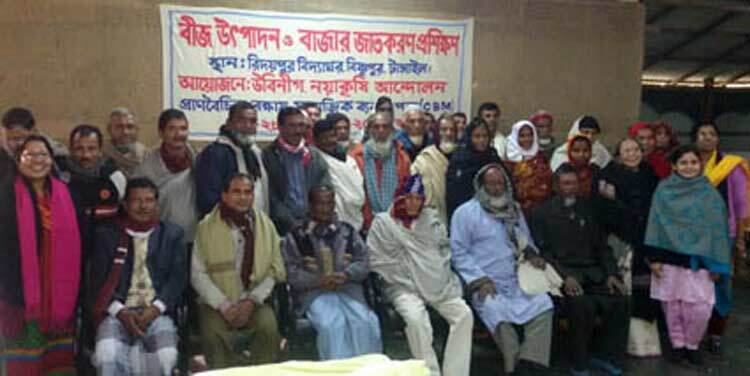 A training workshop on “Crop production and Marketing” involving the Nayakrishi farmers was organized for two days, 28-29 December 2014 at Ridoypur Biddaghor of UBINIG, Bishnapur village, Tangail. UBINIG organized this training workshop. This event is a component of Community-based Biodiversity Management, South Asia network program in which UBINIG is a member with other organizations in the South Asian region. The objective of this training workshop was how to supply chemical fertilizer and pesticide free Nayakrishi crops to the consumers. The main theme of the training workshop was to benefit the farmers financially through proper planning and implementation of activities to that end. The planning for supplying the surplus produce of Nayakrishi farmers to “Shashya Probartana” covered a major segment of the training workshop. So the Nayakrishi farmers jointly planned to supply their season based crops to Shashya Prabartana regularity. In addition to cultivated crops, the uncultivated vegetables will also be supplied to Probartana. This is a very good news for those who regularly buy vegetables from Shashya Prabartana. The uncultivated vegetables include helencha, bathua, kalmi, dheki, dando kolosh, thankuni, etc. 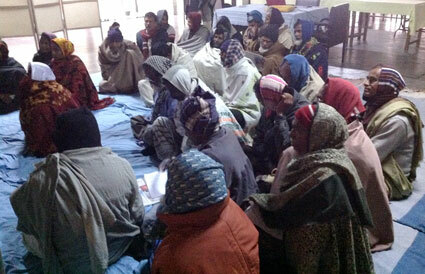 Twentyeight farmers participated in this training workshop. Among them, 26 farmers from 8 villages of 4 unions (Lauhati, Dewli, Attia and Kanchonpur) of Tangail district and two farmers of a village of chandai union of Natore district participated in the training workshop. Among them, there were six women farmers. (1)	Lal chamara, (2) Hijal Digha, (3) Chamara Digha, (4) Shada Digha, (5) Lal Dhepa, (6) Shada Dhepa, (7) Pat Jag, (8) Moynagiri, (9) Jhul, (10) Lakhshidigha, (11) Kartikjhul, (12) Kalijira. Aus rice varieties included: (1) Vaturi, (2) Shaita, (3) Voira, (4) Shankopoti, (5) Kalabakri, (6) Shoni, (7) Moilka. Female farmers group mentioned the names of 22 vegetables. They grow these vegetables in the homestead and open spaces around. These vegetables include bean, water gourd, brinjal, Indian spinach, sweet gourd, ridged gourd, ash gourd, sponge gourd, yam and drum stick. They consume these vegetables and sell the surplus. The farmers having 4 – 6 bigha land, mentioned the names of 22 vegetables. The difference is that the female farmers mainly grow vegetables which are not suitable for cultivation in the field. They mainly grow those vegetables in the homestead areas. On the other hand the male farmers mainly grow vegetables in the field. The male farmers mainly grow potato, cauliflower, cableage, banana, papaya and lemon. The farmers grow 17 varieties of cereals and pulses. These include lentil, black gram, grass pea, and chick pea. The oil seeds include mustard, sesame and safflower. The spices included coriander, zinger, turmeric, onion, garlic, black gram, and chili. The other cereals included wheat, barley and foxtail millet. The cash crops included jute and sun hemp. The farmers consume these crops round the year and sell some of the crops as seeds. The Nayakrishi farmers always maintain seeds in their own hands. Farida Akhter, Executive Director, UBINIG and Rabiul Islam Chunnu, Coordinator, Riderpur Biddaghor, Tangail, UBINIG conducted the Farmers Training: Enhancing Market of Nayakrishi Crops. Mainuddin Molla, Shashya Probartana assisted in the presentation of the training workshop.